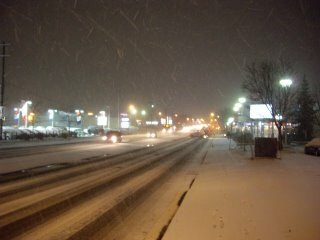 The first major snowfall in Aurora is now coming down. The traffic on Yonge Street (pictured below) is slowing down. I looked out my apartment window to see a sheet of white snow. I love how snowstorms sneak up on you in the winter sometimes. At one moment it is clear blue sky and the next a sheet of white. Ottawa is well known for this phenomenon happening. When I was in first year university in Ottawa I used to love watching from my 20th floor residence room the snow storms advance from the Gatineau Hills to the north, southward until I could barely see across the street. Also in Ottawa I used to enjoying the quiet the snow used to bring to the downtown. I loved walking around the National War Memorial and the Parliament Buildings hearing the snow pile up. The scraping sound off in the distance of snow plows trying to keep up also added to the poetic sounds in a strange sort of way. I do a lot of thinking while walking in the snow. In Ottawa, I used to think about university term papers I was writing (some of them can be found here) on these walks. The questions that wandered through my mind in terms of the paper writing included: "Where am I going with this?" "Do I have enough info to write this?" History has been made with walks in the snow. Just ask Pierre Trudeau who made a famous walk in the snow. Will there be more history to be made in the future with walks in the snow? Probably because "history repeats itself." Canada is made of snow, or is that "snow makes Canadians"? People are considered "unCanadian" if they cannot deal with the snow. So I guess I, like Trudeau, am Canadian because I love the snow!